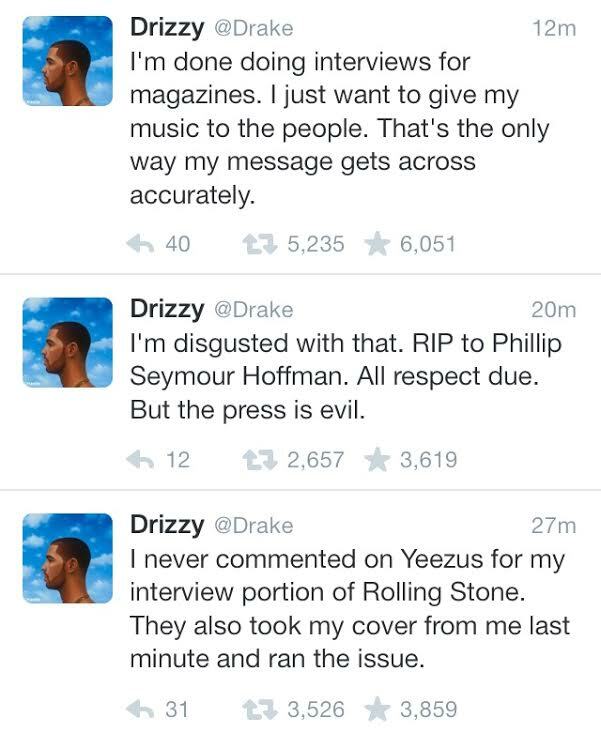 Uh oh, it appears that the big homie @Drake was not at all happy about his recent interview with Rolling Stone Magazine. Drizzy turned to Twitter to vent this morning letting everyone know that he was not at all pleased with Rolling Stone’s antics, and even vowing that he was done with doing interviews. Much like Kanye, who only recently began doing interviews again, it appears that our homie Drizzy Drake will be taking a hiatus from interviews for awhile. Man, I can’t believe he is going on hiatus before I got the chance to sit down with him! Drake keep making those hits that we love and don’t lump us all in the same pool!!! What do you think about Drake no longer doing magazine interviews?